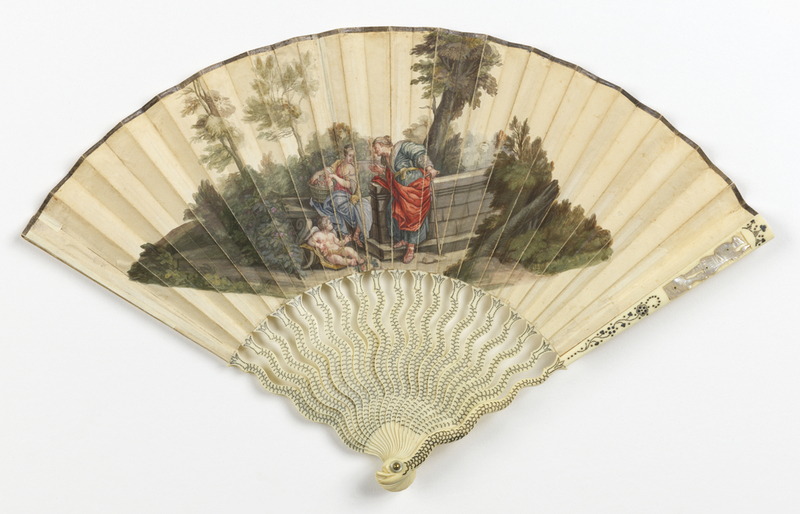 This fan depicts a scene from Roman mythology in which Vertumnus, god of orchards, seduces the nymph Pomona, steward of fruit trees, by assuming the guise of an old woman. The story is best known from Ovid’s Metamorphoses, a collection of myths centered around the recurring themes of love and transformation. Such tales were apt subjects for fans, which could be used as a means of flirtation. Classical subject matter was considered appropriate for social discourse and provided the opportunity to display erudition. Pleated fan, 1730–40, probably England, painted paper leaf and carved ivory sticks with inlaid metal pins and mother-of-pearl, Bequest of Sarah Cooper Hewitt, 1931-6-125.